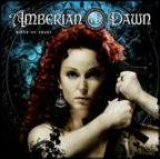 Amberian Dawn: they’re Finnish and they have a female classically trained vocalist. Yes, as you’re no doubt thinking, they do sound like Nightwish, and no, however much you listen this will not go away. So what to do? Well, there’s just barely enough Power Metal goodness here to overcome such feeble criticisms as ‘they’re ripping Nightwish off’, the melodic keyboards and riffs at times bringing Sonata Arctica to mind. All the members have had experience with other bands; both vocalist Heidi and guitarist Kasperi were in Iconofear, the latter a live guitarist for Gamma Ray as well, whilst Tuomas, Tommi, Tom and Joonas (guitar/keyboards, bass, keyboards and drums respectively) were all in Atheme One. Of course, this will mean different things to different people, as only one of these is well-known, but from the first listen to Rivers Of Tuoni you’ll know that you are dealing with professionals that would be much more visible if they ever get in the right place at the right time. Since the band has little original to offer at the moment however, all rests upon the quality of their songwriting, and it’s a mixed bag. Whilst the title track kicks off gamely with verging-on-technical blasts and riffs, the verse-chorus-verse structure soon gets dull. Heidi proves that her vocal training wasn’t a waste of money as she trills along merrily, but her wails feel too rehearsed and predictably placed to have the emotional kick that her superiors manage so easily. Fortunately, the guitar riffs are well-played and crunchy enough to keep you listening, although there’s nothing incredible going on. Little touches like the piano at the start of Valkyries simply aren’t taken far enough, but are enough to make the songs bearable. Yes, you might headbang to Fate Of Maiden, but with a total running time of two minutes and fifty seconds, what is the band trying to prove? Power Metal needs space to breathe, needs time to work its magic on you, and short, sharp songs just aren’t suited to the genre. I can think of just one area where Amberian Dawn would excel, and that’s as an opening band, getting the crowd pumped up as they wait for the real stars of the show, and ultimately that’s all that this band will ever be unless they get their act together sharpish. All the elements are in place – talented musicians, talented vocalist, decent label – it’s unfortunate that they made a debut targeted more at the teenybopper Epica crowd than actually pushing at the genre’s boundaries in some way. Ultimately, then, Rivers Of Tuoni is not the sort of album that you should rush out and buy immediately. As a debut, it’s not bad, but then consider the fact that the band was so starved artistically that they had to put a picture of the singer on the front – never a good sign – and also that they have Italian and Mexican fanclubs according to Myspace, which no band formed less than two years ago deserves. Give this a miss, you’ll find it in the bargain bin in a year or so anyways.